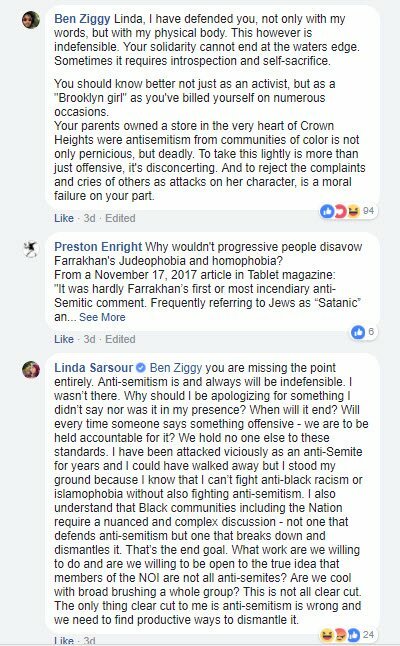 As I have already posted, the Women’s March founders Linda Sarsour, Tamika Mallory and Carmen Perez, have come under heavy criticism for their silence in the face of (at best) and fawning over (at worst) vile antisemite Louis Farrakan. It is important to note that this criticism has even come from some of their own supporters. As for the Jews, she clearly still wants leftist Jewish allies (no Zionists, of course), and is hoping to placate them with wishy-washy statements against antisemitism. But she is not willing to take a principled stand against antisemitism and condemn outright those who disseminate it, when those people can be effective allies of hers. In other words, she is a fraud. But we knew that already. An outright lie, of course, but a common tactic of many to silence critics of real antisemitism. For instance, Jew hater Talib Kweli Greene keeps claiming people like me attack him because he is Black – a claim as offensive as it is false. 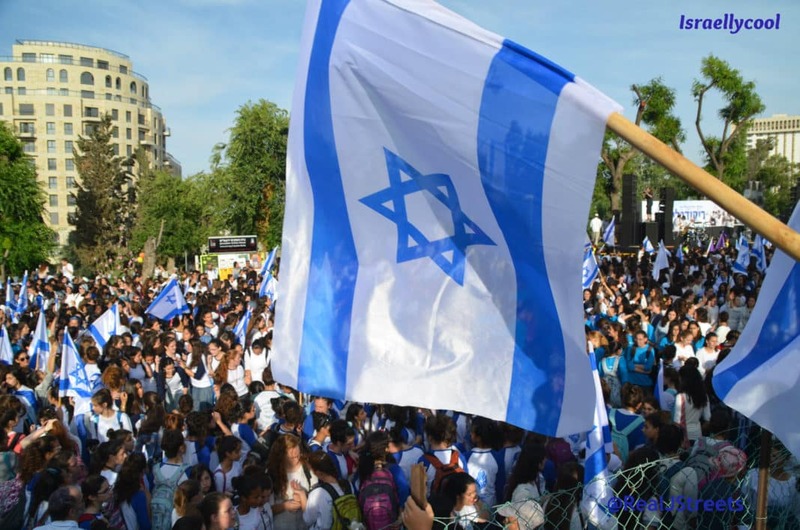 It is reminiscent of claims by Jew haters that we criticize them for antisemitism to stifle debate about Israel. And let’s not forget that Sarsour has admitted she is really White, and only identifies as Black as part of her strategy. 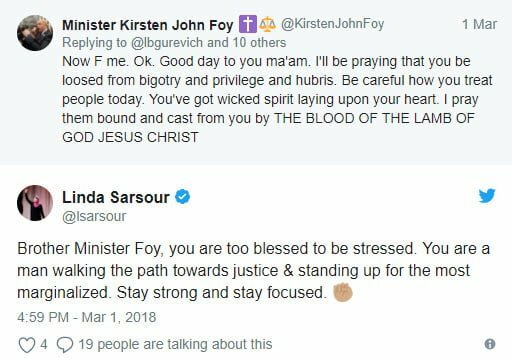 And Sarsour’s excuses for her abhorrent behavior in the face of all of this Jew hatred continue. 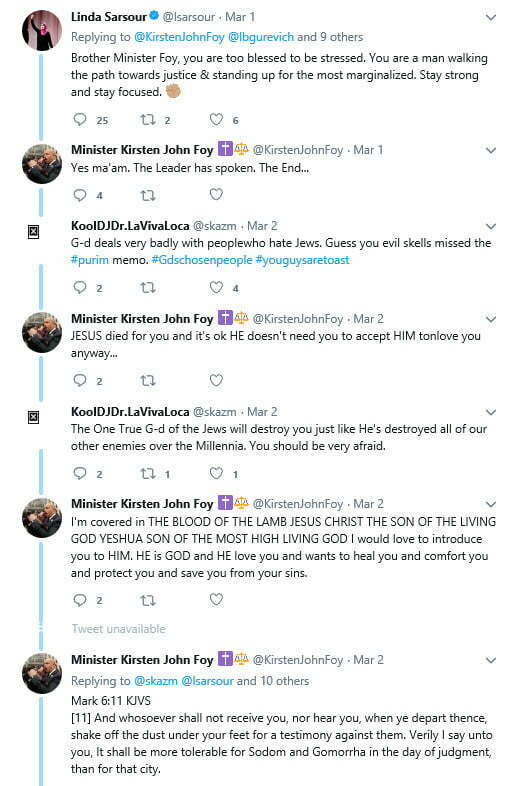 You may recall I posted how she came on to a Twitter thread to specifically defend someone called Minister Kirsten John Foy, who had defended Louis Farrakhan while making some very antisemitic comments himself. 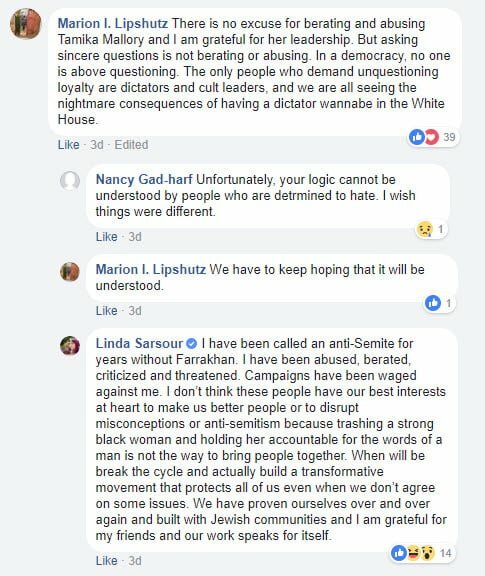 Sarsour received a lot of criticism also for this. Her response? 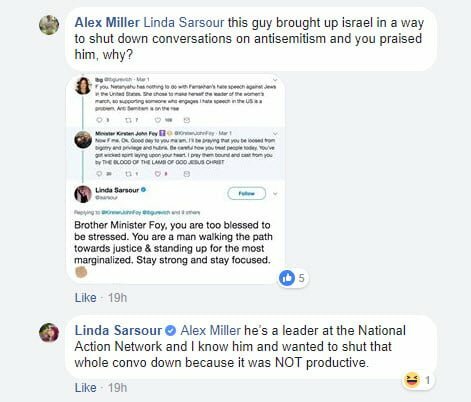 In other words, Sarsour is claiming she praised the antisemite to end the conversation because it was not productive. How about condemning his comments because they were hateful and antisemitic?! For the record, her supposed “strategy” did not work. 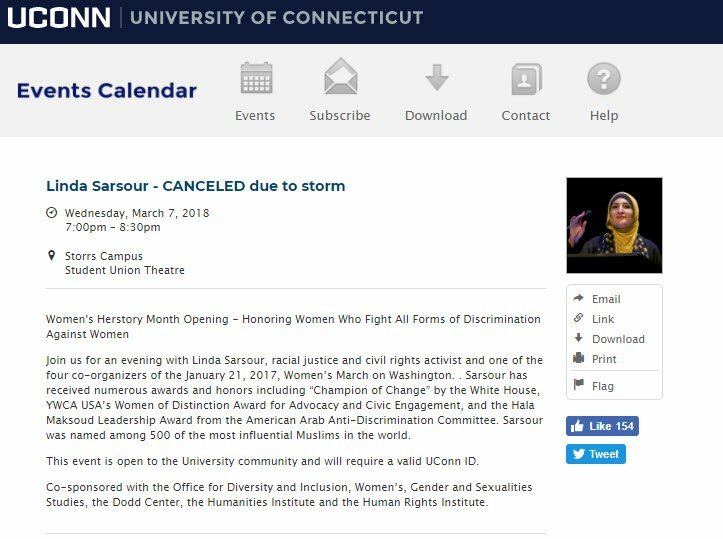 Meanwhile, remember that lecture on Honoring Women Who Fight All Forms of Discrimination Against Women scheduled for last night and organized by the University of Connecticut’s Office for Diversity and Inclusion?